We are currently out of stock on all sizes. Select ... Extra Long 9"
Reversible bracelet featuring fourteen enduring virtues: Courage, Love, Trust, Honor, Family, Truth, Charity. Other side: Loyalty, Unity, Passion, Joy, Kindness, Humor, Hope. Ideal for women and men; available in three popular lengths: 7.5", 8" and 9". Toggle clasp. 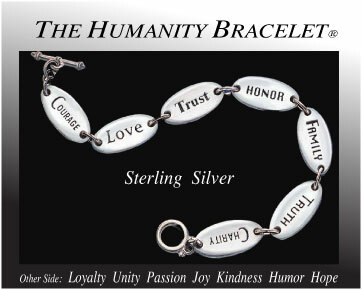 Each bracelet comes with the inspirational booklet, Words to Live By™, short essays on each of the fourteen virtues. Beautifully packaged in a velvety gift box, ready for gift-giving. Whether to celebrate a graduation, marriage or special bond; to pass along our ideals, or to help face difficult situations, The Humanity Bracelet® is the perfect gift.